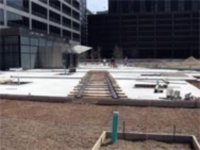 The U.S. General Services Administration (Government) required deck preparation, membrane removal, concrete sawing, and concrete demolition for the reconstruction of the plaza in front of the A. J. Celebrezze Federal Building. The project required the removal of all materials from the 140,000-square-foot plaza, including 10,000 cubic yards of soil, 6,000 cubic yards of concrete, and granite panels, 3,000 cubic yards of stone, and 140,000 square feet of waterproofing membrane. The greatest challenge involved weight restrictions on the plaza. 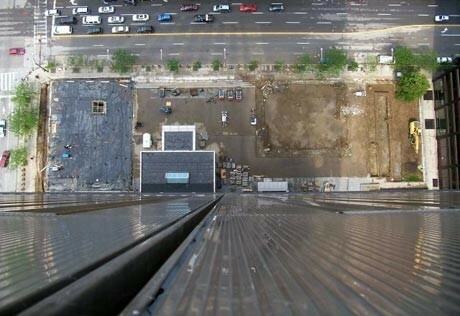 Since the plaza is an elevated slab over an occupied basement, Precision could not utilize heavy equipment on the surface. We were able to engineer appropriate equipment with specialized attachments that allowed us to efficiently complete the work scope moving material as far as 300 foot off the deck. All material was salvaged and recycled to eliminate any disposal costs or landfill concerns. Floor preparation, membrane removal, concrete sawing, and concrete demolition for reconstruction of the 140,000-square-foot plaza in front of the Anthony.J. Celebrezze Federal Building.